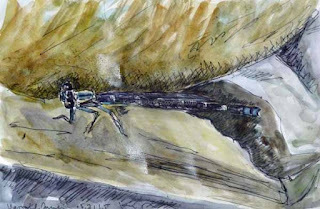 While trying to SEE let alone identify or sketch dragonflies that we've seen in backyard and at Morris Arboretum and the Manayunk Canal over the last few days I was struck by how incredibly difficult it can be to use them as subjects for art. Some, not all, seem to never sit still. Worse they constantly change direction so that it's difficult to even take photos. I say this because with other subjects you might reasonably consider that the subject will continue in the same direction. So you can focus the camera a little bit ahead of the moving object hoping that the shutter will click just as he flies by. Forget that philosophy with dragonflies. They instead will have made two or three 90-180 degree turns instead of heading on to where you expect them to be. I seemed to remember a quote from either Delacroix or Degas about being able to sketch a cat as if fell out of a window. Hmm. I don't think I have any hidden antagonism to our cats. As it is it turns out the quote was from Delacroix and he said that if you couldn't sketch a man jumping from a 4th floor window before he hit the ground you had little future as an artist. But there at least gravity is at work. You pretty much know where the man is heading. He won't make any 90 degree turns or looping curlicues. That's the source of the post title. Compared to drawing dragonflies from life Delacroix's task is easy. Yesterday I took a number of photos of the small damselfly at top. As usual it looked unusual, perhaps a damselfly we'd never seen before. But I know better. It is, at least I'm pretty sure, a Variable Dancer, a damselfly fly that we've seen before including at Morris. You can probably see why this type of photo, or sketch if I'd tried, doesn't often lead to interesting art. The seen is always one of incredible flatness, an almost two-dimensional subject against a flat two-dimensional background. Flat, flat, flat. I think that's one reason that when I use dragonflies in my artwork I make them small, part of a larger scene so that their two-dimensional qualities won't be so evident. On the other hand if I paint them small I lose much of the detail, which is often quite striking. There are plenty of people doing illustrations of dragonflies and they concentrate on the detail, often at the expense of a sense of either animation or environment. But it's hard to get both. I try it various ways. The way I've tried here is to use a pen for the sketch. I know I won't be able to get many details, that the ink will run, and that every mistake will be there to stay. But it does seem to give me some chance of getting a bit of artistic spontaneity into such a horribly flat composition. The Dancer does disappear a bit more than I'd like but at the same time the painting doesn't look like a detailed, but somewhat dead illustration. Since dragonfly season has just begun I'm sure that there will be many more opportunities ahead. 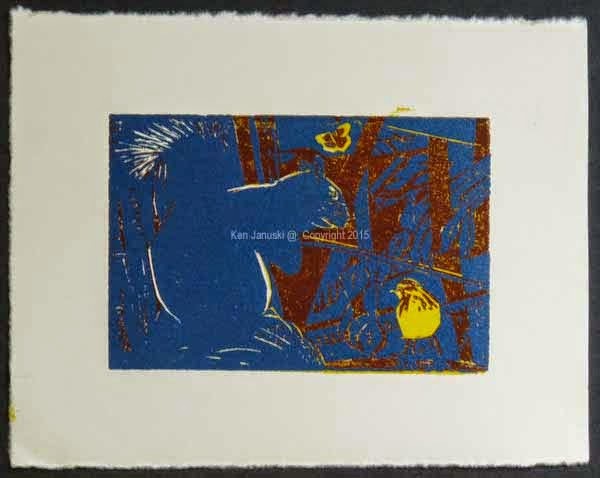 I printed another color on the two-block reduction woodcut of the 'Black' Squirrel, Palm Warbler and Mourning Cloak butterfly and it is below. But the ink continues to take a long time to dry so I had to stop work on it and let the ink dry. In the meantime I decided to try some sketches based on many photos I've taken over the year of 2015. I don't like working from photos. But they can be good for studying details of birds that are often hard to see in binoculars. So anything based on them is almost always a quick study. I can't see doing developed work based on them. In this instance I happened to see a lot of Orchard Orioles over the last few weeks so it was nice to be able to see, and sketch, some of their details. This is a quick pencil and watercolor sketch in a Stillman and Birn Gamma sketchbook. And finally the newest state of the two-block reduction woodcut. After much experimental proofing I decided that I needed to use a lighter tone in the background on the right side, especially as I wanted it to contrast with the black of the squirrel and tree on the left. The last step, I hope, will be to print that black, and to determine how much to leave on the right. This is a 4x6 inch print. It seems ridiculous to be making so many difficult artistic decisions about something so tiny. But what can I do? I've started and I'll finish. Hopefully the results, though small, will prove to be worth the effort. Acadian Flycatcher, Wood Thrush, Red-eyed Vireo, Field Sketches with Watercolor by Ken Januski. You might think that after a number of years of making art, abstract, realistic, or otherwise that it would be easy to get jaded. In some cases that is true. I certainly did with all the IMPORTANT ART that started to be shown around the 1980s. In fact it was hard to go to a gallery and find art that wasn't important. All that important art all over the place. Little matter that is was self-declared IMPORTANT ART. If I had gotten a gallery show at that time, when I was still doing abstract art, I would have tried to have it called UNIMPORTANT ART. Sad to say the art world has only come to take itself more seriously in the years since then, though the huge sums that are used to speculate in art these days makes it easy to keep the illusion up. But I digress............. Even though it is possible to get jaded in art, or any other field, there is one thing that is most likely to bring back the thrill of art to me: someone's sketchbook. It used to be the sketchbook of people like Rembrandt, Degas, etc. But since I've turned to art based on birds it is more likely the field sketchbooks of numerous bird artists. Of course most of the most famous and best-selling bird artists don't seem to do sketching in the field. And it shows. But for those artists that do I can't find anything more exciting. Whether it is the work of a known or unknown artist I find it endlessly rewarding and exciting to see the field work of accomplished naturalistic artists. And the best ones, or at least the ones that move me the most, seem to combine sketches with watercolor. Given all that you'd think I'd be doing that sort of exciting fieldwork myself. Well it's not that I haven't tried. Unfortunately I generally fail miserably. So it's with great pleasure that I show the two pages from a small Moleskine sketchbook above. 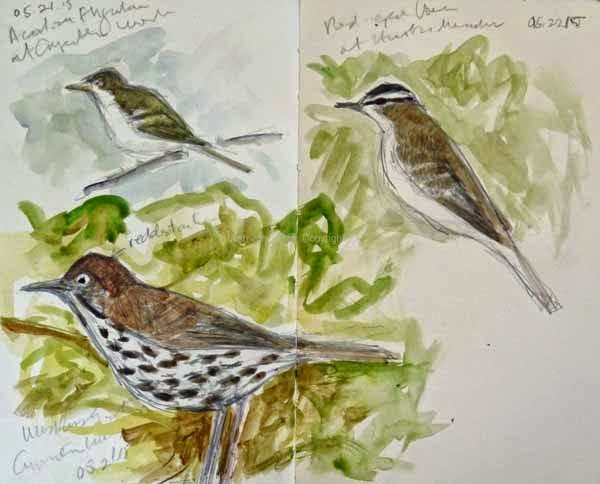 The Acadian Flycatcher, Wood Thrush and Red-eyed Vireo were all seen and sketched in Philadelphia over the last three days. This afternoon I added watercolor to them in the studio. As usual there are a few things that aren't completely accurate about the portrayals. And I could go back, look at reference photos, and correct them. But that I can do in new versions. With these I just wanted to leave them as I sketched them. I'm happy to say that for the first time I excited about my own hand-colored field sketches! Female American Kestrel with Dead American Robin. Hand-colored Linocut by Ken Januski. And speaking of hand-coloring I also completed the linocut of the female American Kestrel eating a freshly killed American Robin with watercolor yesterday. 16 of the prints were left as black prints on white paper. But I wanted to experiment with adding watercolor to 8 of them. Most of the motivation for this was due to the subtle coloring of the kestrel. It is something best captured in watercolor. But I didn't want to do a finicky version in watercolor alone. So hand-coloring a print seemed like a good idea. After you work in the limitations of printmaking it's shocking to all of a sudden be able to use the freedom of painting in a print. So here no print is identical. They are very similar but the brushwork and color in the foreground for instance is slightly different from print to print. That also is very exciting. Both prints are now for sale on Etsy. Yellow-breasted Chat at Higbee Beach. Field Sketch by Ken Januski. As I've mentioned more than once one of my great ambitions is to be able to portray warblers in the field, from life that is, not from photos. I was thinking I'd title this post 'Chats and Cuckoos' and begin by saying what a dud spring it has been for warblers, both here and in Cape May. But then I realized that, at least for the time being, a Yellow-breasted Chat, IS a warbler. 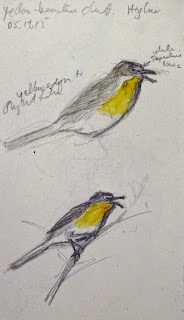 So I'm happy to say that all the sketches on this page were done from life, with the Yellow-breasted Chat, right in front of me, singing his unique song, where the silences are as important as the notes. It's always a thrill to hear and see them. 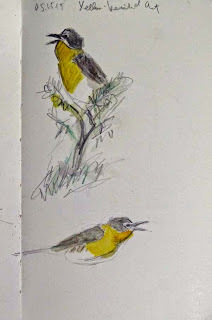 All of these sketches were done through a scope since the bird was really too far away to sketch from binocular views. In the sketch above I added watercolor when I got home, back in the studio. The two below were colored in the field, using Caran d'Ache Neocolor II water-soluble crayons and a water brush. I did touch them up a small bit back at home when I returned. None are great but they do have, at least for me, the excitement of seeing the bird in the wild. And that is what I find necessary in order to do anything more developed, as either a print or a painting. I'm sure that either a print or a watercolor will come from these. I do particularly like the fact that in most instances I've captured each bird as he sang. Yellow-breasted Chat at Cape May Point State Park. Field Sketch by Ken Januski. Yellow-breasted Chat at Higbee Dike. Field Sketch by Ken Januski. It's not the most elevating experience of spring but it is one that happens with great regularity, a Red-tailed Hawk pays a visit to the nest of Red-winged Blackbirds. And you can guess why he's there: to make food of the eggs and/or young. So every spring you see the sight above: Red-winged Blackbirds attacking a seemingly impervious Red-tailed Hawk. I've never actually seen one make off with an egg or young but I pretty much expect that this is what happens. This quick pencil and watercolor sketch is based on a photo I took today at Morris Arboretum. What I had hoped for if not expected today was a great show of warblers. But it was not to be. Spring is moving along and we've seen very few warblers. The one great showing recently was as I walked out of Carpenter's Woods to meet a deadline. After 4 hours of birding they appeared, mainly Black-rhroated Blue Warblers, just as I had to leave. Warbler Karma. But there is more to the world of birds than warblers. including American Kestrels and American Robins. 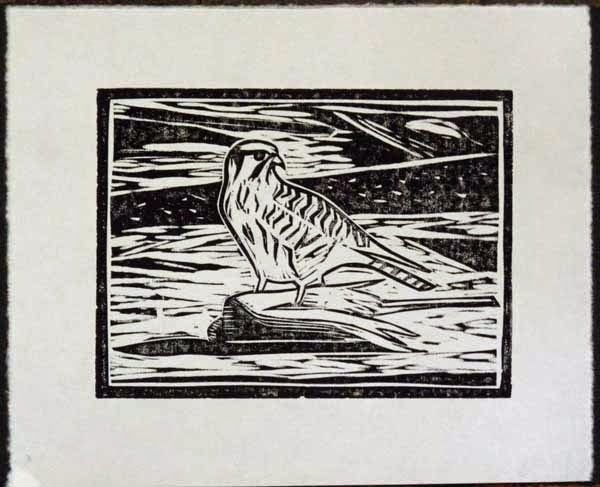 Above you see the final edition of the American Kestrel Eating American Robin linocut. I printed it in an edition of 24, but I'm holding 8 back to hand color. So this version is 16. The hand-colored version, when I get to it, and if all goes well, will be 8. It is completely by accident that I'm focusing on raptors here. It all started with a loud "Coo, Coo, Coo, Coo." That is more or less the truth. It actually started with a Philadelphia e-bird rare bird report that a Black-billed Cuckoo had been seen at Houston Meadows last Saturday. I'd already been planning to go to there on Monday morning but the report gave an added impetus. After sorting through the 10 or so more familiar bird songs and calls I heard as soon as I arrived the loud and clear call of the Black-billed Cuckoo, sounding more what the non-birder would expect a cuckoo to sound like, rather than the "kowlp, kowlp, kowlp" of the Yellow-billed Cuckoo, the more common cuckoo in our area. It took me a while to find him and I moved slowly and cautiously because cuckoos seem easily spooked. I knew he was close and finally spotted him 20-30 feet away 30-40 feet in the air, pretty much out in the open. 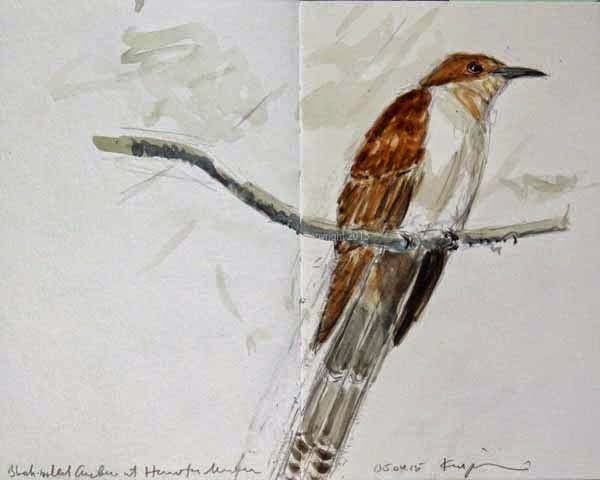 Black-billed Cuckoo and Wood Thrush. Field Sketches by Ken Januski. Once I got a good look at him in my binoculars I took out my sketchbook and started sketching. I didn't have my scope and tripod so it was back to the usual method of looking through binoculars, then sketching while I stood, tying to coordinate with two hands the three objects -- sketchbook, pencil and binoculars -- that really needed three hands. This is an awkward method and much is lost. BUT it's much harder to get lost in detail, thus missing the overall sense of the bird, that is so easy when viewing a bird with the heightened magnification of a scope. 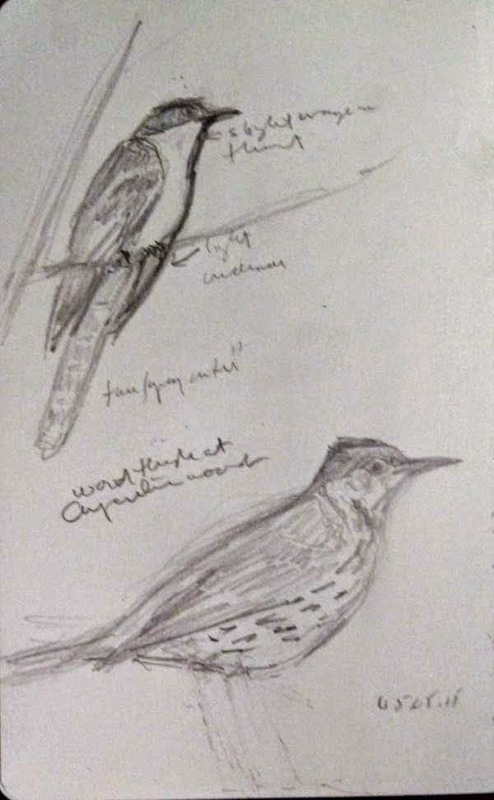 (Later in the day I stopped at Carpenter's Woods and indulged in one of my favorite type of drawing -- drawing thrushes. That is the other drawing on the page). 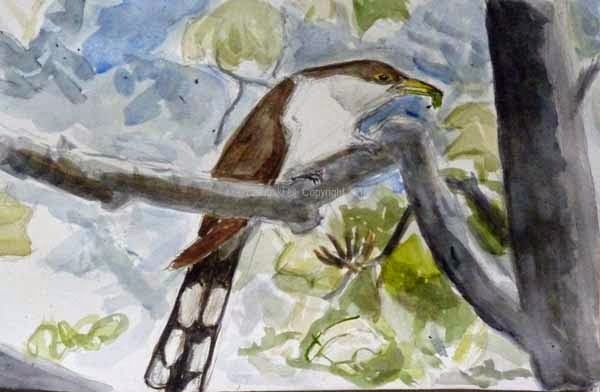 Later in the day I did the pencil and watercolor sketch at top of the Black-billed Cuckoo. Though I took at least 30 photos only 2-3 turned out. The watercolor is based on the best one, coupled with my field sketch. Oddly I didn't realize until I started looking through my field guides that this bird had some characteristics of an adult cuckoo, specifically the red orbital ring, and some of a juvenile, the buff/rust wash on throat and the grayish underside of tail. Yellow-billed Cuckoo at Carpenter's Woods. Watercolor Sketch by Ken Januski. Thrilled as I was with seeing the Black-billed Cuckoo I decided to spend early Tuesday at Carpenter's Woods looking for warblers. It was pretty quiet. Until 8:00 a.m. when a large bird landed in the ungainly way of cuckoos about 10 yards away. There was a Yellow-billed Cuckoo. I've learned to not immediately grab for my camera when I see a bird I'm happy to see. First I look, just appreciating the bird, but also trying to memorize its appearance. Then I may sketch and/or I may reach for my camera. I realized that given how close he was that the movement of removing my camera from its case might be enough to scare him off. And, yes, just as I got the camera out and raised it to my eyes to focus he flew, not to be found again. Since cuckoos are favorite birds of both myself and Jerene when I returned home I suggested that we stop by again later, while out running errands nearby, in the hopes that he'd still be there and that Jerene could see her first cuckoo of the year. We did return to Carpenter's Woods but found no sign of the cuckoo. At least not in the area he had been. But quite a distance away we heard the familiar "kowlp, kowlp, kowlp." Momentarily he appeared near us then flew off to distant trees. He was just close enough to recognize in our binoculars and barely close enough to take a photo of. Again I took about 30 photos but all with the bird a tiny speck in the entire photo. Still there was enough detail for me to do this pencil and watercolor sketch this morning. I'm still looking forward to seeing all the warblers. But I can't complain about three looks at two different cuckoo species in the space of 24-30 hours. 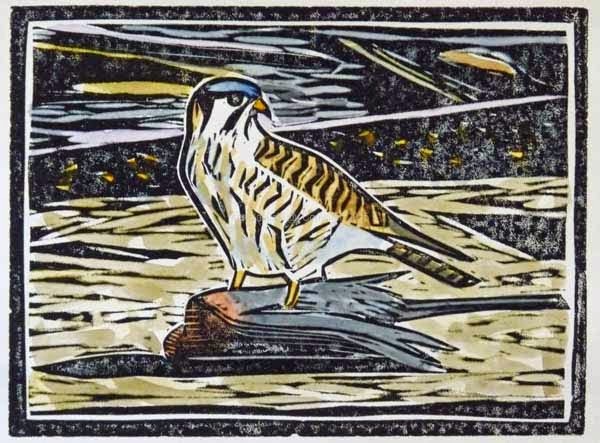 Later to day I hope to print the one color version of the American Kestrel linocut. Palm Warbler, Blue-gray Gnatcatcher, Yellow-rumped Warbler, Blue-headed Vireo and Scarlet Tanager. Pencil Field Sketches with Crayon and Wash by Ken Januski. Anyone who has read this blog, even if only occasionally, over the last few years know how I struggle with trying to capture the migrating Neo-tropical migrants from life. I also take photos and I've done work based on them. But my goal is to be able to work from life. 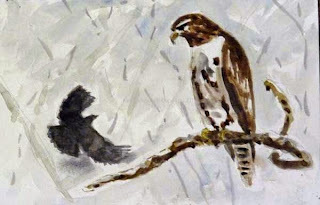 I started working with birds as subject way back when at the end of 2006. Occasionally I look at the oldest work and I'm astonished at how bad it is. This is true of my bird art in general but especially with bird art based on field sketches and birds seen in the field. The first problem of course if that I may only see them for a split second before they're gone or obscured by foliage. In the course of trying to capture them from life I've tried: photography, pencil, ballpoint pen, Faber-Castell pen, Caran d'Ache pen and fixpencil, crayon, waterbrush, watercolor, Stillman and Birn Sketchbooks, Moleskine sketchbooks, Aquabee sketchbooks, to name the ones that stick out in my mind. Above you see the most successful results so far, in a small Moleskine sketchbook. These sketches were all done from life or from memory soon after seeing them live with Caran d'Ache fixpencil and Neocolor II Water-soluble crayons, with a wash done by picking up the pigment from the crayon with a waterbrush. That's quite an explanation for what could be considered mighty skimpy results compared to the work of those who are successful with sketching and painting Neo-tropical migrants from life. But for me it is a huge distance I've travelled. I currently go out with a larger sketchbook and hope to do some larger field sketches from life. If I do I hope to be able to add color through the same use of crayon and wash. 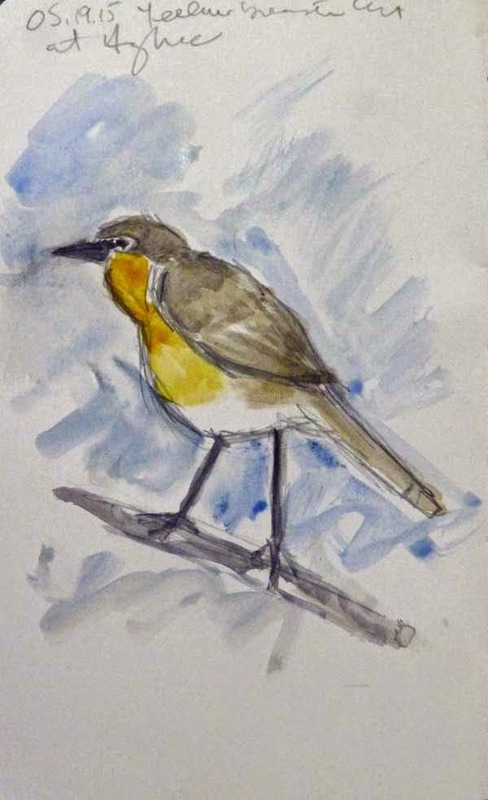 It's hard to do field sketches of such striking birds. The easy temptation is to just grab the camera. 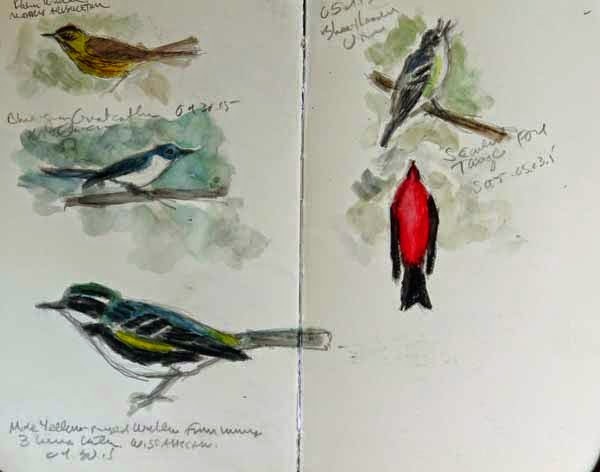 But I try to forgo that, instead sketching first as with the Scarlet Tanager seen today and the Blue-headed Vireo seen a couple of days ago. I also know that I've never been able to make anything out of Scarlet Tanager photos. I think I'll never be able to make a painting that works with them. But when I saw this one today, with such a simple shape and such starkly contrasting Red and Black I was sure that I could capture it with the Neo-color II crayons. And I think I did. It is this boldness that strikes me when I see a Scarlet Tanager and it is that more than anything else that I want to capture. Maybe eventually I'll do something more developed. 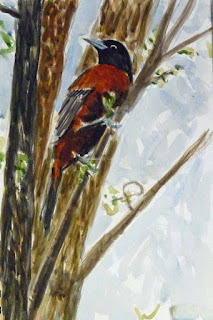 But for now I know that this simple, small sketch captures for me the thrill of a male Scarlet Tanager. 'Black' Squirrel, Palm Warbler and Mourning Cloak. 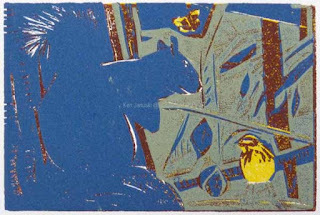 Color Three of Four/Five Color Reduction Woodcut by Ken Januski. It has taken forever to print the third color of the squirrel woodcut. I cut and proofed, cut and proofed, cut and proofed, trying different colors, trying to get the ink to flow evenly and trying to figure out what to cut and what to keep. Finally today I printed the third color. It is darker and grayer than this photo shows. But that doesn't make a lot of difference because I hope that little of it will remain in the end. I want it primarily to create a sense of sheen on what I hope will be the rich black of the squirrel. Some of the blue in the background will remain, but more will be covered by the black and possibly another yellow that should make a green. My hope, for this tiny 4x6 inch print, is that it will end up being a bold and striking print, contrasting the rich black of the squirrel with the bright yellow of the Palm Warbler and Mourning Cloak butterfly. It seems a bit crazy to me spending so much time making decisions about a tiny 4x6 inch print. But I hope I'll learn something from it that will pay off in larger prints. 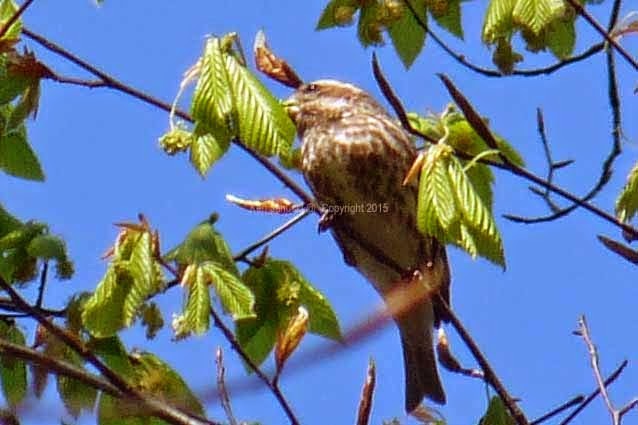 Purple Finch at Morris Arboretum on 05.02.15. Photo by Ken Januski. 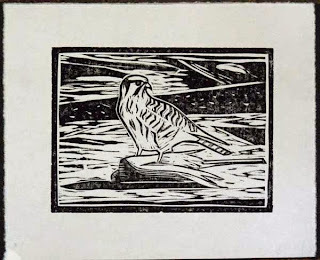 The other delay with the woodcut, and the kestrel linocut which remains in limbo, is migration. These early days of May, especially if not too hot are the best fullest days of the year for a birder or bird artist in this part of the country. The birds are here, the foliage largely is not, so that you can actually see the birds, and the weather is beautiful. So I've been out a lot, looking, sketching and taking photos. There are many birds I expect to see. But one that caught me by surprise yesterday was this Purple Finch at Morris Arboretum. This is one of 6-8 that were there, handsome as could be, right where the migrating warblers should have been.